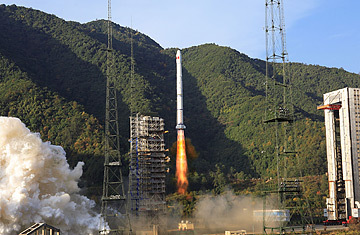 A Long March-3A carrier rocket, with a Fengyun-2D meteorological satellite, blasts off from Xichang, Sichuan Province, December 8, 2006. It's springtime for anti-satellite missiles  again  now that China has fired a missile into space and destroyed an aging weather satellite orbiting 500 miles above the earth. The James Bond-style exercise left a several-hundred- meter-wide cloud of scrap metal floating around in space. Some of the debris could pose a threat to spacecraft passing through the region, scientists say, and will remain a problem for hundreds of years to come. And there will be repercussions on Earth, too. Protests and expressions of concern were lodged over the test by the U.S., Japan, Canada, South Korea and Australia, but Beijing has so far refused to comment on the issue or even confirm the test took place. "The brazenness of this is a bit frightening," says Mike Green, former senior Bush Administration Asia adviser. "It shows that the Peoples Liberation Army has considerable leeway  a great deal of influence if not autonomy  to increase their capacity even at considerable diplomatic cost." The reason for all the fuss is simple: the test potentially marks a major step forward in China's ability to nullify the huge technological advantage of the U.S. in any clash over Taiwan. While Western intelligence agencies have long been aware that the People's Liberation Army was attempting to develop an anti-satellite system, the successful targeting of a single satellite in high orbit marks a significant milestone. When the Pentagon issued its annual report to Congress on China's Military Power last summer it stated that "China can currently destroy or disable satellites only by launching a ballistic missile or space-launch vehicle armed with a nuclear weapon." All that has now changed. The development recalls the competition between the U.S. and the Soviet Union two decades ago to be the first to develop an astral flyswatter capable of blasting the other guy's satellites to smithereens. Moscow's was crude, but effective: a lumbering orbiting nuclear warhead that would detonate close to an enemy satellite. Washington came up with a finer blueprint, trying to perfect what Pentagon officials called their "flying tomato can," launched atop a missile flung from an F-15 fighter. But as the Cold War sputtered to a conclusion, so did this quest for space weaponry. Now, the Chinese have mastered the tomato can. And by doing so at a distance from Earth greater than the one at which most critical U.S. satellites orbit, Beijing has demonstrated a capability, however limited, of punching out Washington's technological eyes. Indeed, it was reported last September that China had "painted" a U.S. satellite using a ground-based laser. The Dr. Strangelovian angle on what the Pentagon calls ASAT  anti-satellite  weapons is that a foe could use them to blind key U.S. spy satellites as the first punch in a massive war. While such a notion carried some weight during the Cold War, such a war seems markedly less likely in today's world, some U.S. officials believe. Still, developing its anti-satellite capability is only one of a series of steps China is taking aimed at leveling out the playing field in case of a clash with the U.S. Other examples include the training of units designed to hack into military computers, and the development of massive shore-to-ship missile batteries that would make it very difficult for U.S. carrier groups to approach China's coast. The U.S. dependence on its technological edge is considerable: Green explains that in recent joint exercises held with the Indian Air Force, less technologically advanced Russian Sukhoi jets defeated American F-15s when the latter were deprived of support from satellite and AWACs systems. The test and the reluctance, thus far, of Chinese authorities to confirm it, also raises the question of whether the military acted in a semi-autonomous manner. Green notes that there have been occasions in the past when the PLA has appeared to directly breach a diplomatic agreement reached by China's Foreign Ministry, notably over the passage of Chinese submarines through Japanese home waters. And because U.S. officials fear that one scenario in which a conflict between the U.S. and China over Taiwan could occur involves an independent or rogue action by disgruntled generals, any sign of independent action by the military brass is cause for concern, says Green. In fact, behind the scenes, tensions have already been rising over what U.S. officials say has been a steady build-up of Chinese forces on the coast opposite Taiwan in the last year. Washington has already expressed concern about the build-up to Beijing. The anti-satellite missile test may prompt renewed diplomatic discussion. But it's not clear what effect such expressions of concern will have on Beijing's decision-making.